Well done, you’ve just found the latest and greatest website on diabetes and exercise. This site has been developed as a source of info for people with diabetes and wondering how to control it through exercise, sport and diet. Diabetics, just like everyone else, should lead a healthy lifestyle and having diabetes shouldn’t stop you from being active. In fact, one of the best ways to keep blood sugars down is to exercise. 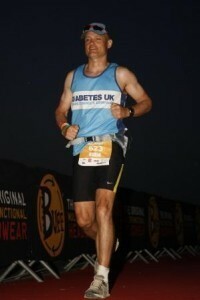 Whether it’s a stroll in the park or a full blown Ironman triathlon having diabetes shouldn’t hold you back. It will be a journey – a journey of discovery – but hopefully a pleasant one. I’ve had my moments, like being miles from home out on a run when it started to snow and my meter didn’t work as it was so cold; and learning how to keep sugar levels high enough on long outdoor swims by keeping a couple of gels under my swim cap. You’ll find diabetics in all walks of life as well from the armed forces to business to charities. We’re pretty normal people. The site’s not affiliated with any organisation, just my own ideas and meandering experience. It’s intended to be helpful but light-hearted and I’d appreciate sensible feedback – as may other people who read the site – so do get in touch if you have any comments via the blog or the contact form.